In a time of bald-faced white supremacy and discrimination, the Nebraska exhibition Monarchs feels vitally relevant. OMAHA — Surveys of contemporary American art aren’t uncommon, but it’s rare to see one solely focused on “people native to the Americas.” That’s one of the starting points of Monarchs: Brown and Native Contemporary Artists in the Path of the Butterfly, an exhibition currently on view at the Bemis Center for Contemporary Arts, along with a geographical conceit: the middle of the United States merits closer attention. Monarchs mines these arguably underexplored premises and turns up capacious, invigorating results. Although the show isn’t didactic, its politics feel vitally relevant in a time of bald-faced white supremacy and discrimination. The conceptual focus of the exhibition is the monarch, the only butterfly that migrates in two directions, as birds do. Monarchs (specifically eastern North American ones) travel between Canada or the northern U.S. and Mexico, where they spend the winter. A migration can cover up to 3,000 miles and takes three to four generations of butterflies to complete. Monarchs traverse many parts of the US, but one of their primary pathways runs through the middle of the country, through so-called “flyover states” like Oklahoma, Nebraska (home of the Bemis Center), Minnesota, and the Dakotas—where the Standing Rock Reservation is located. 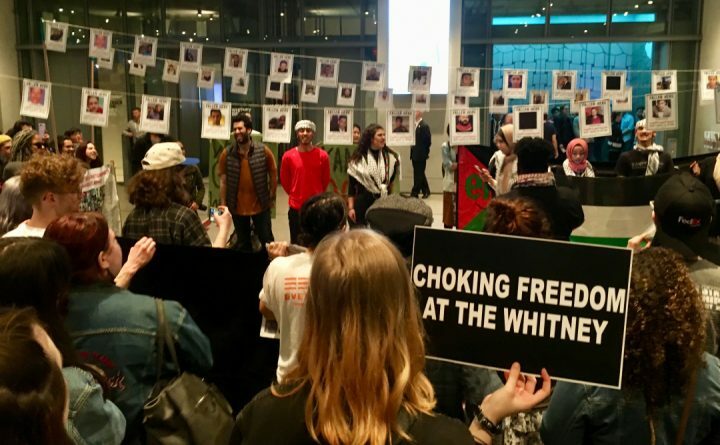 When curator Risa Puleo (who has contributed to Hyperallergic) conceived of the exhibition, in the summer of 2016, members of the Standing Rock Sioux and other water protectors were facing off against the builders of the Dakota Access Pipeline. Meanwhile, Donald Trump was on the campaign trail, talking about building a wall between the US and Mexico. Puleo saw these phenomena, despite their geographic distance, as “conceptually undergirded by a logic of occupation that has dictated policies managing and containing the lives of people indigenous to the Americas for the past 170 years,” she writes in her introduction to the catalogue for the show. When she traced a line between Standing Rock and the US–Mexico border, she found that it followed the path of the butterfly. If this sounds like an overly elaborate conceptual premise for an art exhibition, well, it might be. 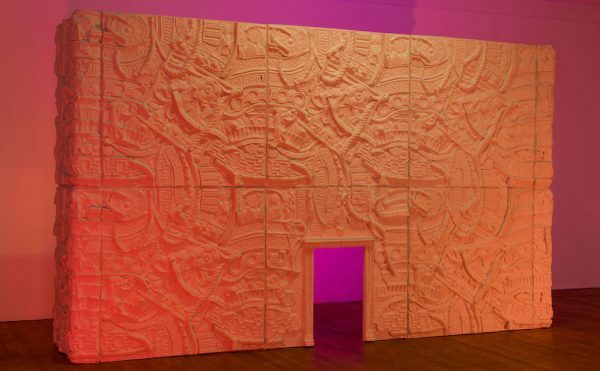 Puleo has gathered works by 37 artists who are Native and Brown — her preferred terms for those of Native American and Latin American descent — and either come from or live in the monarch’s migration path. Those are salient identity factors, but not necessarily enough of a foundation on which to build a cohesive show. Instead, what holds together Monarchs — which fills all the Bemis’s galleries — are common themes among the artists’ work, some of which derive from traits that Puleo identifies in the butterfly. One of the most important is migration itself — or the opposite, a lack of movement. Both positions imply a specific relationship to the land. 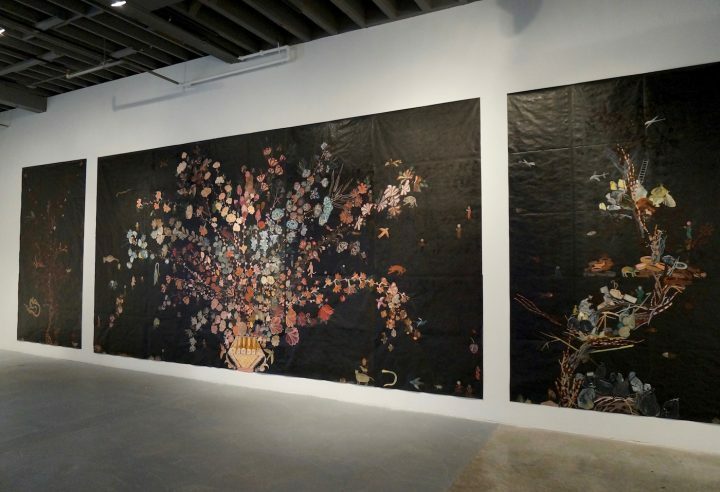 Take, for example, one of the first works you see upon entering the Bemis: Gina Adams’s Its Honor is Here Pledged, an installation of her Broken Treaty Quilts. 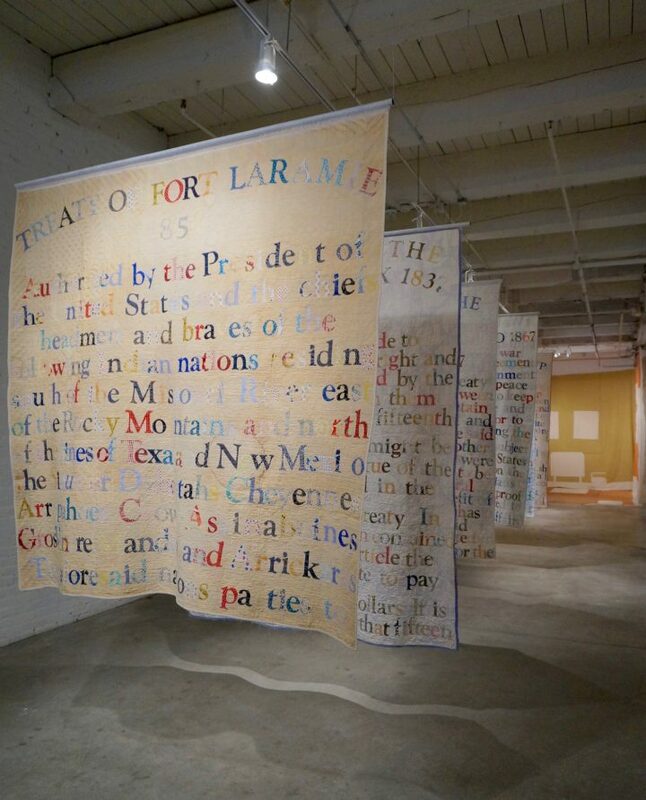 Adams makes the works by cutting out letters from new and used calico, then sewing them onto found antique quilts. Each modified quilt contains the text of a different treaty between the US government and Native American nations between 1778 to 1871. One of the quilts at the Bemis displays the 1848 Treaty of Guadalupe Hidalgo, which ended the Mexican–American War and set the new border between the two countries. 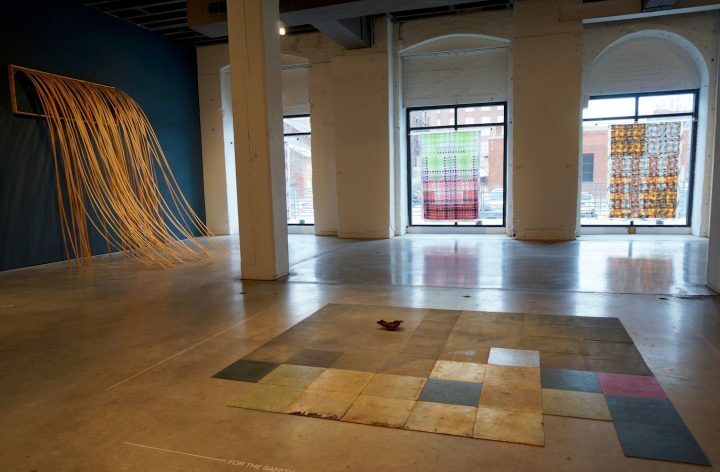 Fittingly, Adams’s quilts hang in a line in a hallway-turned-gallery, suggesting movement through both space and time. Their clashing patterns make the text hard to read — a fitting state for treaties that were almost always broken, amended, or ignored by the US. Standing before and among them in the gallery makes you think about the land under your feet, and the people from whom it was stolen. 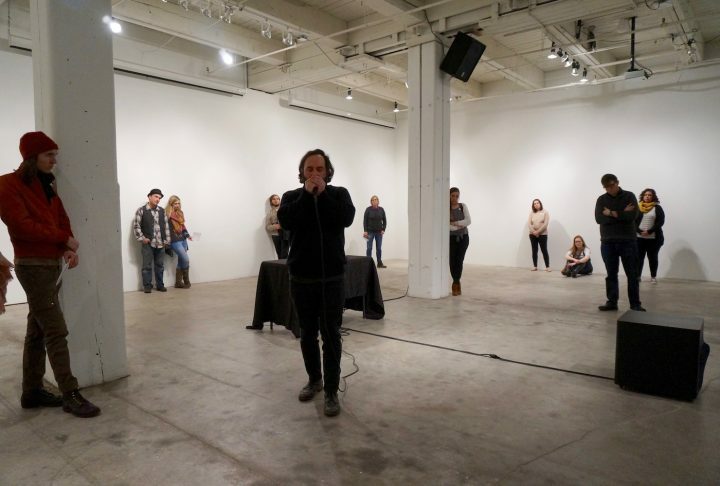 Elements of Nathan Young’s nearby sound work, “Hatkiraar (STUTTER)” (2017), also fill the air: droning sine tones and Pawnee elders translating traditional songs of their people. In the late 18th and early 19th centuries, the Pawnee lived, among other places, in Nebraska. What was once migration becomes displacement: this is both a historical and an ongoing reality for many people in the Americas. 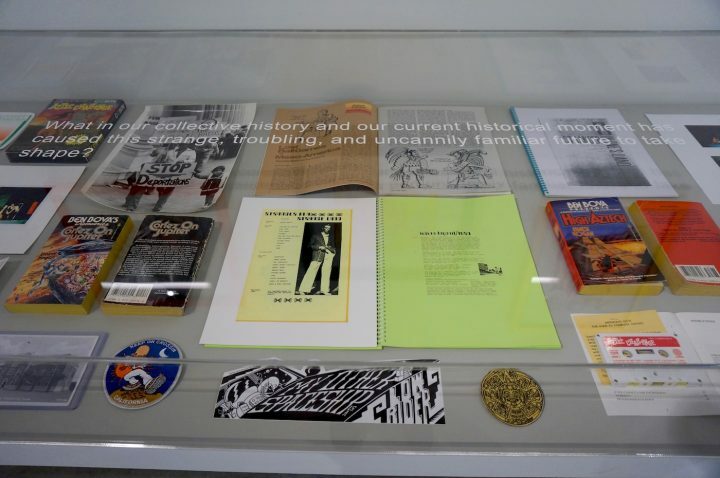 Gonzalo Reyes Rodriguez explores it in his multichannel video of immigration and anti-gentrification activists, who read aloud revolutionary speeches from Mexican golden-age films at contested sites around present-day Chicago. At first, the language feels dated and the readers hesitant, their delivery almost deadpan. 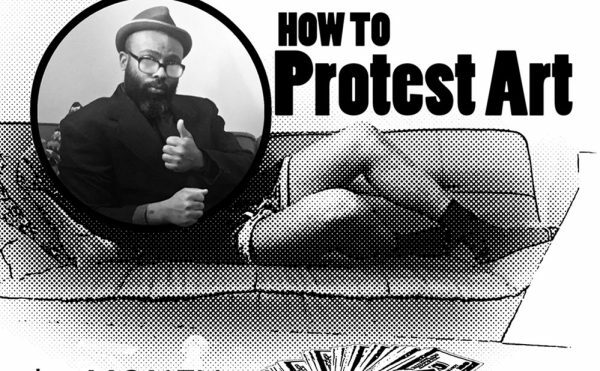 But as the activists settle into the words, their potential power becomes palpable. Cannupa Hanska Luger and Marty Two Bulls Jr. render the effects of displacement in their collaboration “Wasted” (2017). 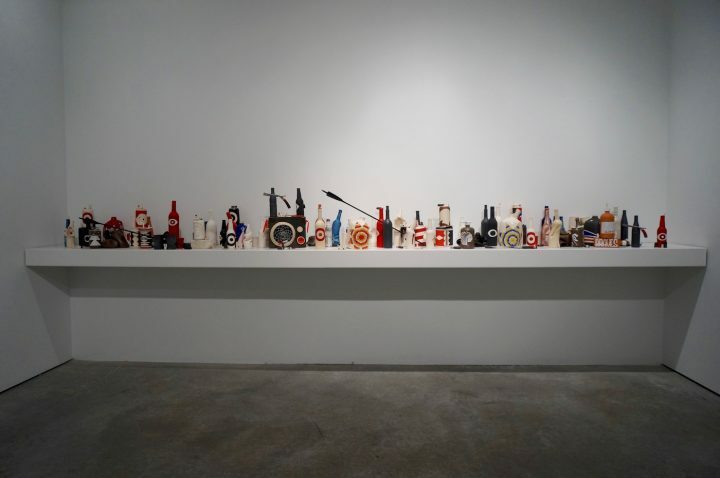 The installation is an accumulation of handmade ceramic alcohol containers, which look as though they’ve been shot through with holes, crushed, or topped with cigarettes (also ceramic). 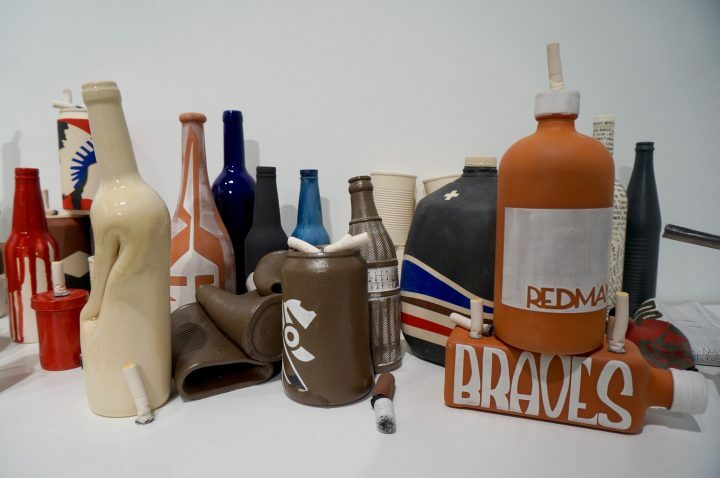 Native stereotypes, such as the racist mascot of the Cleveland Indians baseball team, appear on some of the bottles, while sculpted arrows and knives hint at violence. 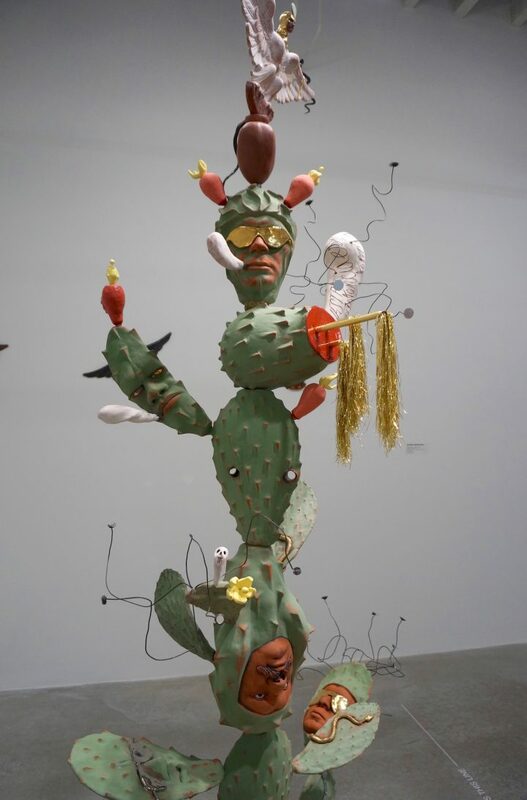 The work is both a remarkable display of skill and a devastating representation of the alcoholism that has plagued Native communities since the arrival of European colonists. Colonization and assimilation — and the question of what differentiates them — appear throughout Monarchs, most hilariously in Merritt Johnson’s video series Exorcising America (2014). The short videos show Johnson attempting to enact popular English idioms and expressions, such as “don’t bite the hand that feeds you” and “keep your head up.” A female voice provides information and instructions to Johnson in an eerily pleasant tone, explaining, “In order to know your place, you must study where you stand” and instructing her to put on multiple pairs of pants and tape them together in order to keep her pants on. She does this, with some difficulty. 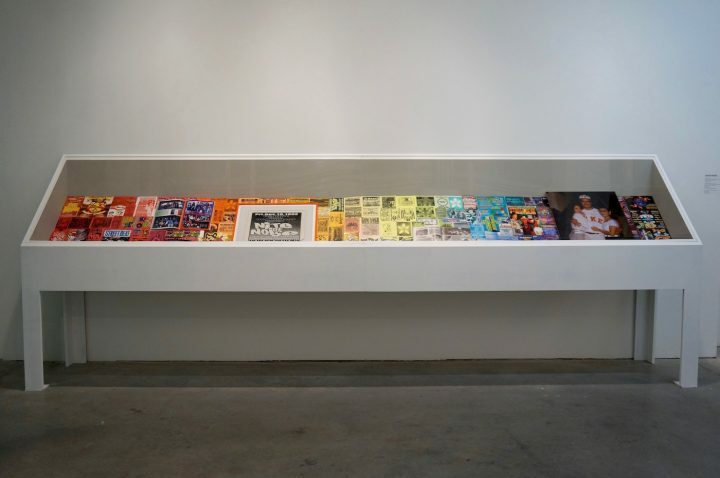 Inheritance is preserved in the archival projects in the show: Guadalupe Rosales’s “Map Pointz” (2017), which displays a rainbow of flyers, photographs, and magazines from the 1990s Latino party crew and rave scene in LA (posted on Instagram at @map-pointz); and Josh Rios and Anthony Romero’s “Is Our Future a Thing of the Past?” (2015–present), a collection of materials related to Brown visions of the future, aka Chicanx Futurism (including a range of work by Chicano science fiction writer Ernest Hogan). They share a gallery with two meditative videos by Sky Hopinka, in which he learns Chinuk Wawa, an indigenous and nearly extinct language, and logs a series of audio recordings sent to him by his father, a powwow musician. 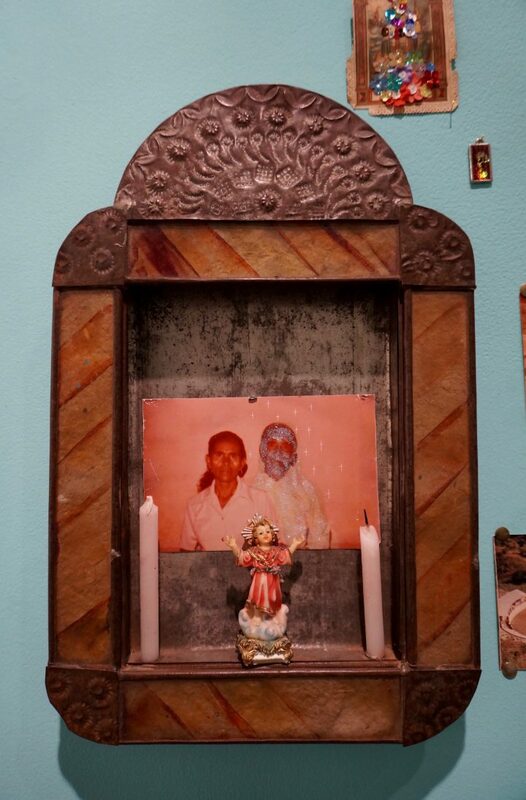 All these artists have amassed collections to which they have deeply personal relationships, working as both heirs and protectors. Others in Monarchs engage with their inheritance by updating it. Dyani White Hawk masters quillwork by incorporating it into her paintings — she meticulously places quills to form blocks of color in “Black and White IV” (2016) — and by imitating it, in the masses of tiny brushstrokes that make up the five-by-seven-foot “Untitled” (2017). Truman Lowe’s parents were basket makers; he responds by unweaving a basket to create the elegant abstract sculpture “Waterfall” (1993). 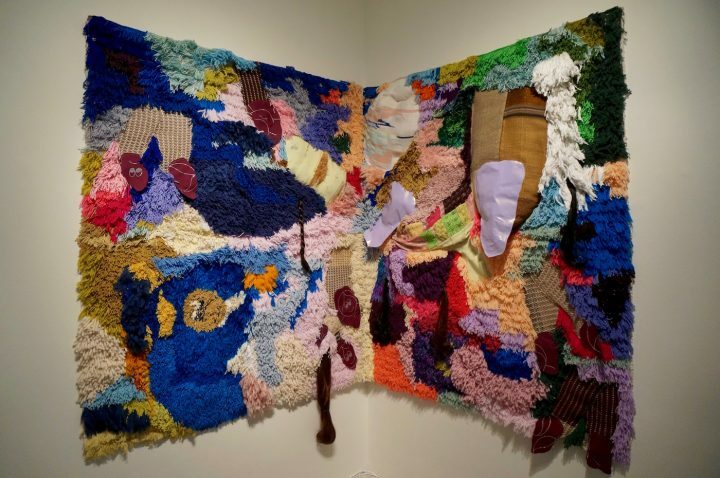 Inspired by arpilleras, the textiles sewn by Chilean women to show scenes of poverty and oppression during Pinochet’s dictatorship, Sarah Zapata created “Siempre X” (2015–16), a modern, abstracted arpillera whose playfulness is offset by clumps of hair and other suggestions of women’s body parts. 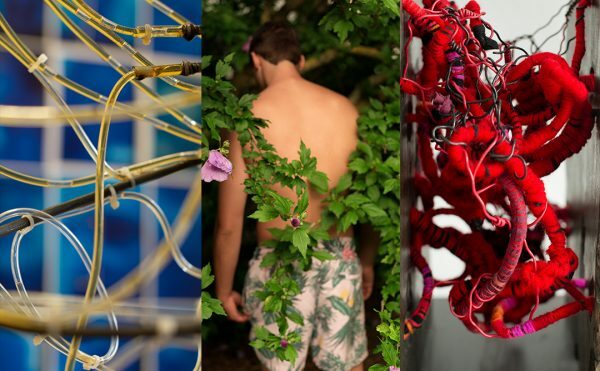 There’s a resourcefulness that permeates Monarchs, a pattern of artists taking what they’ve been given — whether an artistic tradition, a construction material, or a treaty — and transforming it into something new. 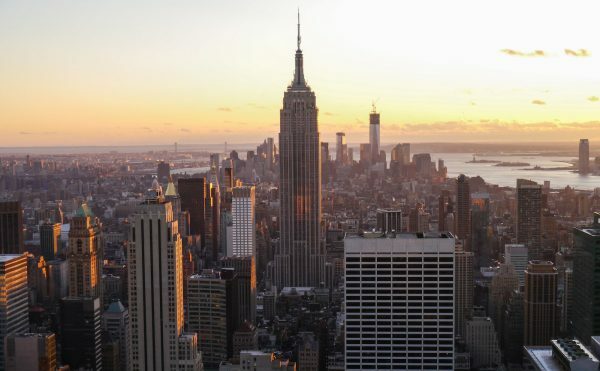 This is a method of adaptation and growth, an expression of the politics of resilience. “Exercising survival is inherently disruptive,” Merritt Johnson and Nicholas Galanin say in their video “Exorcising America: Survival Exercises” (2017). The artists in Monarchs have had to survive marginalization for too long, but they are, unflinchingly, still here. 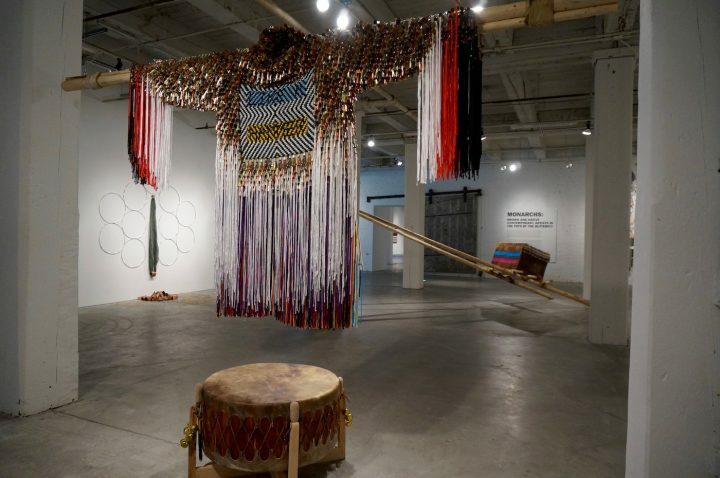 Monarchs: Brown and Native Contemporary Artists in the Path of the Butterfly continues at the Bemis Center (724 S 12th Street, Omaha, Nebraska) through February 24. Editor’s note: The author’s travel expenses were paid for and lodging provided by the Bemis Center.